« The CalDigit VR Mini. Serious Storage. On the Go. Now Shipping! CUPERTINO, California—July 23, 2009—Apple® today announced a significant update to Final Cut Studio® with more than 100 new features and new versions of Final Cut Pro®, Motion, Soundtrack® Pro, Color and Compressor. Final Cut Studio features Final Cut Pro 7 which expands Apple’s ProRes codec family to support virtually any workflow and includes Easy Export for one step output to a variety of formats and iChat® Theater support for real-time collaboration. Motion 4 includes enhanced tools such as 3D shadows, reflections and depth of field for stunning motion graphics and visual effects, and Soundtrack Pro 3 features new multitrack audio tools to streamline audio post production. Color 1.5 includes better Final Cut Pro integration and support for full color resolution, and Compressor 3.5 adds new features that make it easy to set up and customize your export options. At $999, the new Final Cut Studio is $300 less than the previous release and is also available as an upgrade for just $299. Final Cut Pro 7, the latest version of Apple’s Emmy Award-winning editing software, includes new versions of Apple’s ProRes codecs to support virtually any workflow with the addition of ProRes Proxy, for offline and mobile editing at low bandwidth; ProRes LT, for general purpose editing; and ProRes 4444 for editing and visual effects at the highest quality possible. Easy Export allows users to continue working on projects while encoding is done in the background and the sequence is exported to YouTube, MobileMe™, iPhone™, iPod®, Apple TV®, DVD or Blu-ray. iChat Theater support allows real time collaboration by sharing Final Cut® timelines or individual source clips with iChat users anywhere in the world, even if they don’t have a copy of Final Cut Pro. Other new features include new speed tools to change clip speed with ease, alpha transitions to create dramatic effects using moving mattes, and native AVC-Intra support for the latest high quality Panasonic cameras. Motion 4 extends award-winning, easy to use animation tools so video editors can quickly create everything from basic titles to animated credit rolls to stunning motion graphics. Enhancing 3D compositions is faster than ever with new customizable features that add point and spot lights to cast realistic shadows or turn any shape, video plane or paint stroke into a reflective surface. Motion 4 gives editors the flexibility to adjust the depth of field within a 3D canvas by selectively highlighting a single object or using multiple objects to create a racking focus effect. Soundtrack Pro 3 adds powerful new audio editing tools including Voice Level Match which extracts volume information from the vocal content of one clip and applies it to another without altering any other audio content so editors can easily correct mismatched voice levels. An enhanced File Editor includes new tools to make sophisticated edits and fine tune volume adjustments by targeting specific frequencies such as the rustle of a paper or the bump of a desk without affecting dialogue. The new Advanced Time Stretch feature stretches and compresses audio with incredible precision using three Apple-designed algorithms or other algorithms available as third party plug-ins. Color 1.5, Apple’s easy to use professional grading application, now works with a greater range of sequences and effects from Final Cut Pro and an integrated workflow allows editors to complete projects entirely within Final Cut Studio. New 4K support works natively with files from cameras such as the RED ONE and outputs directly to ProRes for HD or DPX for film. Expanded support for new high quality formats includes AVC-Intra, XDCAM 422 and ProRes 4444, for grading with the maximum amount of color information. Compressor 3.5 makes encoding and delivering in multiple formats easier than ever with the ability to automatically detect QuickTime® settings and create an Easy Export template or a mini “droplet” on the desktop that automates specific Compressor actions. New, customizable sharing options make it easy to publish to YouTube and MobileMe, or export for iPhone, iPod, Apple TV and mobile phones. For the highest quality HD material, menu templates and encoding presets make it fast and easy to create Blu-ray discs. Final Cut Studio also includes DVD Studio Pro®, a powerful DVD authoring environment with drag and drop tools, on screen editing and real time previews. Soundtrack Pro and Compressor are also available as part of the new Logic Studio®, allowing Final Cut and Logic® users to collaborate and share files. 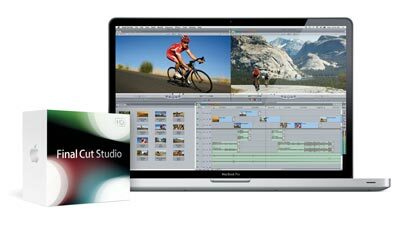 Apple today also introduced Final Cut Server 1.5, the asset management and automation tool for Final Cut Studio. Final Cut Server 1.5 includes powerful new features like lightweight, offline editing with ProRes Proxy, production hierarchies to organize media, and support for still sequences to easily view and manage image sequences for graphics and effects workflows. Final Cut Server now includes unlimited client licenses and is available for $999 or as a $299 upgrade for existing users. Final Cut Studio is now available through the Apple Store® (www.apple.com), Apple’s retail stores and Apple Authorized Resellers for a suggested retail price of $999 (US) and existing Final Cut Studio and Final Cut Pro users can upgrade for a suggested retail price of $299 (US). Full system requirements and more information on Final Cut Studio can be found at www.apple.com/finalcutstudio. Final Cut Server 1.5 is now available through the Apple Store (www.apple.com), Apple’s retail stores and Apple Authorized Resellers and includes unlimited client licenses for a suggested retail price of $999 (US) and existing Final Cut Server users can upgrade for suggested retail price of $299 (US). Full system requirements and more information on Final Cut Server can be found at www.apple.com/finalcutserver. *Based on data from broadcast and professional video market research firm SCRI International, Inc. showing Apple is the market leader for post-production with 50 percent of broadcast and post non-linear editor purchases in 2008.